Thewa Jewelry – An Indian luxury – COME MAKE IN INDIA.SELL ANYWHERE AROUND THE WORLD. The gems and jewellery market in Jaipur is one of the largest in the country. There are more than 400 jewellers in Jaipur that dot the length and breadth of the city, but only a handful of them deal in luxury jewellery. The definition of what classifies as luxury jewellery varies from one jeweller to another but most agree that any piece of jewellery above Rs 15 lakh could be called luxe. 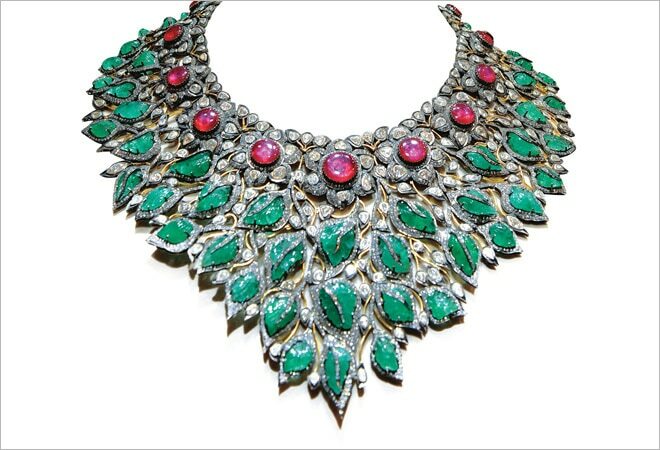 Until a decade and a half ago, ethnic luxury jewellery from Jaipur had only a few takers such as rich individuals and royalty. But the scene has changed since the turn of the century. The booming rich class and rising popularity of traditional Indian products around the world has increased demand of luxury jewellery made in Jaipur. Hollywood stars now wear Jaipur-made jewellery for their private parties while Indian actors and women from affluent families put it on at wedding functions. Indeed, Indian luxury jewellery stands out for its distinct designs, which includes kundan, meenakari (enamelling) and thewa. Enamelling is the art of coating the surface of gold and silver with vitreous enamel (made from molten glass) of different colours in an intricate design pattern. The designs may involve simple geometric shapes or more sophisticated patterns. This art was introduced to India by the Mughals and brought to Jaipur by Raja Man Singh around the 16th century. Kundan involves setting of precious stones in a jewellery piece using gold foil while Thewa is the art of embossing a filigreed sheet of gold onto molten glass to make jewellery and artefacts. Today I will let you know what is Thewa Jewellery which has got a big export market potential.One may think to start sell such jewellary through online eCommerce store. Thewa is a 400-year-old art of making jewelry and has its origin in Rajasthan. It started under the patronage of Maharawat Samant Singh in the Pratapgarh district of Rajasthan. Thewa, which means “setting” in a literal sense, is a unique way of fusing gold and colored glass to create magnificent pieces. The invention of this at is credited to Nathu ji Soni, whose family kept the craft a secret to be passed from father to son only. It is said that the same family has been practicing the art ever since it was invented and the secret still remains with them. They call themselves “Raj-Sonis” now and some of their family members have received awards from the Government and also from UNESCO. To motivate this form of art, the Government of India issued a postage stamp in the year 2004 commemorating Thewa. Thewa continues to be an inimitable form of art because of the amount of labor, craftsmanship and detail that goes in the making of a single piece of jewelry. The basic Thewa jewelry is made on a mottled sheet of pure gold combined into a colored glass which then constitutes a single unit. This entire range of jewelry is handmade and sometimes a single piece of jewelry takes more than a month’s time. The glass that is blended with the gold, is treated by a special process which renders a dazzling effect and in turn highlights the gold patterns. Over a period of time, the makers of the jewelry have come up with customizations to the traditional way of crafting a Thewa piece. Thewa is now being combined with the Kundan art which is again a traditional art of jewelry and adds another dimension to the original Thewa. Thewa jewelry is prominent all over India. Crossing the borders of Rajasthan “the land of colors”, Thewa now reigns over the hearts of women throughout the country. The last century saw a new version of Thewa in the Cannetille style i.e. the contemporary European style. This opened the doors for this essentially India style to the rest of the world. The Metropolitan Museum of Art and some other museums display some pieces of this art. 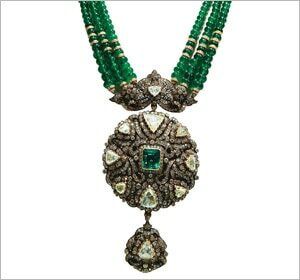 This jewelry style is so in sync with the Indian sentiment that even Prince Charles was gifted a special Thewa item on his marriage, by the Government of India. The method of preparing Thewa jewellery is time consuming, exhaustive and grandiose due to the complexity and delicacy involved. One piece can take over months for the craftsmen. This process starts when fragments of terracotta are smashed and combined with certain chemicals and oils to prepare a dense paste. This paste is then spread on a timber board post which, gold sheet(s) of about 23 carat purity and of a certain thickness is set onto this paste. This gold sheet has a design impressed on it. It is then covered in dark paint so that the design is visible and can be stenciled easily. Additional gold is removed later. The colored glass is initially treated to give it a glittering effect so that the gold work once merged, looks even more extraordinary. Colored glass is actually the base which acts as a unit for the gold. The glass in the ornament is suggestive of semi-precious stones such as sapphire, emerald and ruby. Finally, a gold foil is attached onto the base and the unit is then mounted onto a silver foil separately; after all is done, the unit is made into a piece of jewelry. Thewa jewellery comes in varied shapes like round, oval, square or rectangular and all shapes are equally radiant and alluring. It is generally seen that the designs in the Thewa jewelry are inspirations from Hindu mythology. They also narrate the folklore of courage and romance in the form of visuals. Depiction of nature is again a common choice for the base design. The themes are innumerable, ranging from historic scenes involving famous battles to portraits of rulers or even the Indian gods such as Lord Krishna. A lot of motivation also comes from the flora and fauna which renders a lively touch to the jewelry. In general, Thewa resonates with the rich heritage and culture of Rajasthan. It owes it colorful and vibrant nature to the themes chosen from life, nature, history and myth. 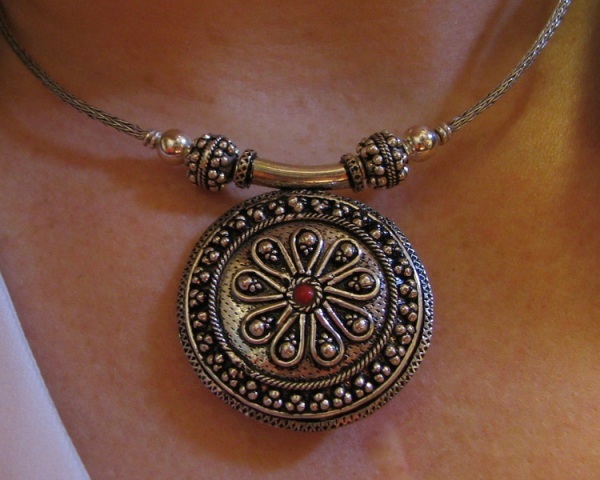 Thewa is hence, more than a beautifully designed piece of ornament; it is a way of life for many. Thewa is one of those few crafts of making jewelry which use a variety of colors that are normally absent in others. This blend of colors, glass and hard work demands a huge price but there are portals from where you can get original pieces for reasonable rates also. The jewelry and items are generally expensive not just because of the design, but also because of the consummate skills and the elaborate handiwork that nurtures every single Thewa ornament. Undoubtedly, Thewa is a masterpiece in any form, be it jewelry or other items such as vases, chandeliers, wine glasses, lamp shades and many more. Thewa, as an art form in jewelry, is indeed a pride to our nation!